It was the start of an ongoing relationship with the now 16-year-old city service, which in 2018 handled over 20,000 daily phone calls and 3 million individual reports equaling more than 44 million interactions in total. The service’s 400-plus employees handle everything from noise complaints to dispensing daily parking updates and inclement weather advisories via the 311 call center and app, as well as text messages and social media. “I was annoyed [about the taxis] and wanted to do something about it, and I learned about 311 and the Taxi and Limousine Commission,” Novich said in a phone interview. “These complaints don’t fall into a black hole, and there’s a lawyer at TLC, and there’s real action.” When filing his online complaints, however, Novich realized the 311 website didn’t have TLC-specific complaints – back in 2014, 311’s reporting options were more limited than they are today. As a product manager for tech companies, Novich spends his days creating and implementing user-friendly technology solutions. He decided to create his own solution for TLC-specific complaints: a mobile app called Reported. “A year and a half later, I have an email from the director of 311 saying we added that capability into the 311 app, largely inspired by the Reported [user experience]. And that changed the trajectory of the app,” said Novich. Since then, Reported has evolved into an easy-to-use collection point for New Yorkers who spot and submit evidence of TLC, commercial, and private vehicles blocking bike and bus lanes. It takes less than a minute to submit a report, making it far quicker than direct 311, and the app keeps each user informed of its status, including the outcome of any TLC court hearings. The app empowers, as Novich puts it, the most vulnerable road users to hold drivers accountable for dangerous behavior. In 2018, over 4,500 complaints were filed on Reported, which generated approximately $380,000 in revenue for the TLC as the result of fines imposed on drivers. According to Novich, complaints submitted through Reported represent 15 percent of all 311 complaints filed to TLC last year. The Reported app is an example of New Yorkers taking matters – including the city’s open data – into their own hands, creating ‘civic tech’ to serve their needs and better understand their surroundings. While 311’s adoption of it was a major milestone for both parties and the public, some say the service is still woefully behind in its modernization. A City Council oversight hearing in February highlighted the differing response times by agencies to 311 complaints. The Department of Buildings, for example, prioritizes their 311 complaints by threat level to public safety, taking anywhere from nine hours to over 90 days to resolve one complaint. A new version of 311 is expected to launch later this year, but it’s not clear how updated its capabilities will be in terms of accepting photos with complaints. Open data is defined as “Free public data that is published by New York City government agencies and a few other government adjacent partners, like libraries and the housing authority,” said Adrienne Schmoeker, deputy analytics officer for the Mayor’s Office of Data Analytics (MODA). New York City’s open data law has been on the books since 2012, and updated since. It requires a great deal of public data to be made available at a single internet portal. The law was strengthened with requirements to make all open data available in perpetuity and the inclusion of dictionaries to clarify the available data sets. Currently, over 2,000 data sets are available on the Open Data portal, with 311 contributing nearly a decade’s worth of complaints and geotags to the city’s collection. “Open data isn’t going to go away depending on the administration,” said Schmoeker. Neither is MODA. 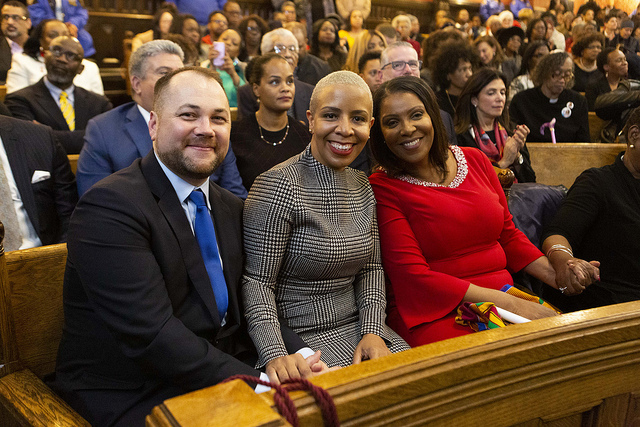 The office was added to the city charter through a City Council bill passed in December 2018, making data analytics an official part of City Hall. Open data is important in modernizing governments, which according to Schmoeker are centuries-old enterprise-level organizations, and have pain points and legacy systems (such as 311, though it is much newer than other systems) requiring updates. “Modernization means that more and more data is going to be collected, ideally in a responsible way, thinking about not collecting data for data’s sake, but for the purpose of improving services to New Yorkers and making as much of that data available back to the public as possible,” said Schmoeker. When a user submits a blocked bike lane report with Reported, the app combines that information (license plate, where the violation occurred, and the date) along with additional data accessed through the city’s open data portal, which verifies if the vehicle is TLC-registered, i.e. a yellow or green taxi, among other functions. After merging the user-submitted info with the backend data, the final actionable report is submitted to 311. 311’s data is also of interest to Alec Barrett, a lead developer for data visualization studio Two-N. Last month, he led a session on 311 data visualization at School of Data, an annual open data, civic tech, and design conference sponsored by BetaNYC, an independent civic tech organization, in partnership with MODA. “311 data is generated by citizens directly. Using it you can see evidence of problems being solved, or if something is an isolated incident,” said Barrett. One of those problems, according to Manhattan resident, Community Board 6 representative, and Reported app user Rich Mintz, is parking placard abuse. It’s an ongoing issue of city employees exploiting their status by parking illegally, and mostly not getting ticketed for it. Some drivers use placard proximations, like NYPD patrol manuals or MTA vests, to park illegally, and often get away with it. 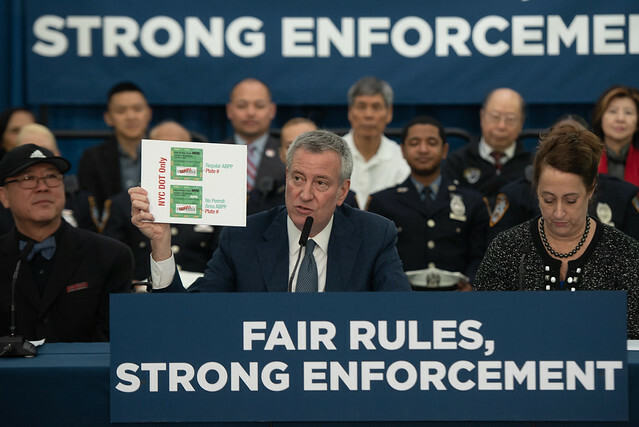 Currently, five separate bills designed to curb placard abuse have been introduced to the City Council, and Mayor Bill de Blasio recently announced a second round of plans to fight the problem, after his first effort proved unsuccessful. The Reported app collects photos, but 311 currently doesn’t accept them – and placard abuse is supposed to be enforced by the NYPD. Mintz blames some of the lack of enforcement on 311’s inability or unwillingness to accept photographic evidence of placard abuse. “What happens is when the police close a  ticket saying they didn’t observe the violation, there’s no way to respond to that with clear photographic evidence,” he said. New York City and its neighbors have a problem. Unlike Los Angeles, Chicago, and the other major U.S. metropolitan areas that fit neatly within the standard city, county, and state political boundaries, our metropolitan area of over 22 million people does not. We’re spread out over four states and 26 counties, five of which are called “boroughs” and were integrated together to create our city over 100 years ago. All these complex boundaries and jurisdictions have resulted in a metropolitan area that has been “divided and conquered” by the politics of patronage, enabling networks of political insiders and special interest groups to dominate New York City’s electorate, advancing their own interests at the expense of ours. This has resulted in our area’s city and state governments passing higher taxes and providing lower quality services, more corruption, and less infrastructure investment than comparable cities and regions around the world. People living in the New York Metropolitan Area (NYMETA) might live over 100 miles apart, but we still work at the same jobs and in the same industries, go to many of the same universities and hospitals, and root for (or at least have strong opinions about) the same sports teams. We often travel the same roads, ride the same train lines, use the same airports, drink from some of the same aquifers, eat the same foods, and get rained on from the same clouds. With so much shared environment and infrastructure, you’d think that there would be powerful entities helping us align our shared interests, coordinate our actions, and deliver us results at a regional scale. Unfortunately, that isn’t happening. There is no single entity or group responsible for systematic coordination within our metropolitan area. Instead, we have a hodgepodge of coordinating bodies spanning different sectors, areas and functions. Sometimes those bodies are prestigious nonprofit entities with relatively meager budgets like the Regional Planning Association, other times they’re multi-state authorities with huge budgets run by political elites like the Port Authority, and often it’s informal coordinating bodies that do little more than network individuals and hold annual meetings, and most commonly, there is just no coordination taking place at all. What types of opportunities could a better coordinated region be generating? Here are some examples. We’re experiencing a housing crunch in New York City, and there are a myriad of housing development opportunities in the Hudson River Valley and tons of New Yorkers who’d happily commute from a high rise in Poughkeepsie to a job in Midtown Manhattan if the commute could be done in under two hours and for a reasonable price. A coordinating body -- let’s call it NYMETA -- would be responsible for bringing all the players together: Metro North Railroad, town governments, real estate developers, and New York City to streamline regulatory processes, align incentives, and get deals made and buildings built. Another example: New York City schools are feeding over a million kids a day, our regions small farms are looking for reliable consumers of their products, and the school system is looking for locally sourced healthy food, but their corporate contractors are trucking in frozen produce from hundreds of miles away. The city is also building programs that expose youth to nature, rural communities, and agricultural-based industries. NYMETA could work with rural counties to help them aggregate and organize food supply, and work with New York City to aggregate and organize school demand, and then build the relationships needed to get our kids eating healthy local food and empowering our regional farmers at the same time. Beyond managing classic coordination challenges like road and rail linkages, we also need an entity that can represent our region on the national and global stages, where major cities and their regions are playing an increasingly important role in global affairs. Many leaders, including major CEOs, politicians, philanthropists, philosophers, and futurists have predicted that, over the course of the 21st century, nation-states will cede more and more political power to cities and metro-regional governments, and those governments will network together to coordinate policies at global scale. Evidence of the rise this “municipalist” power structure is everywhere, from the United Nations HABITAT conference that brought cities together through the U.N. structure for the very first time in 2016, to various networks of city governments like the League of Cities and Networks of Cities, and through outcomes like the C40 process to tackle global warming. Places like Paris and Los Angeles have, through the luck of sensible political boundaries, entities that can, to some extent, represent their metro region at these events. NYMETA could perform this function for us, enabling our region to leverage our massive population and other resources when negotiating agreements and deals with other major global regions, not to mention what could be done within the U.S.
An important step towards any political organizing project is collecting and displaying the most basic information about geography and demographics. Who would fall within a metro regional government? What would its boundaries be? The new Metro Region Explorer website from New York City’s premier digital service organization, NYC Planning Labs, answers these questions with an open source software tool that mashes a bunch of datasets about our metro region together to provide data-driven stories about demographics, employment, housing, and other baseline statistics needed to understand our region. Unlike many GIS tools with lots of confusing check boxes that you need to click off and on to get useful information, Metro Region Explorer does the work for you by giving you some stories you can toggle through and menu items that reveal the most important data. Click around the site and insights will likely pop into your head as they did mine: New Jersey is building tons of housing while western Nassau and eastern Westchester counties aren’t. Lots of jobs are moving out of Connecticut and into New York City and Long Island. Central Jersey has a huge immigrant population. Wow. Metro Explorer isn’t just a cool mapping tool for planning nerds. As Gotham Gazette reported in its article “With New Data, City Takes First Step Toward Regional Planning,” its development indicates that the city is getting serious about improving our region’s capacity to understand itself and coordinate between and among jurisdictions. As the largest government with the most capacity in the region, it’s up to New York City to begin the process of developing a more integrated regional coordinating body. But building a dedicated office to do this work is not enough. We need an entity accountable to the 22 million people, 900 municipalities, and 26 counties of NYMETA. Developing such an entity will produce tangible benefits in the short term and create a whole new set of opportunities over the long term. It’s time to start envisioning NYMETA. Smartphones are transforming transit in cities all over the world, and city governments are struggling to figure out how to best manage the change. 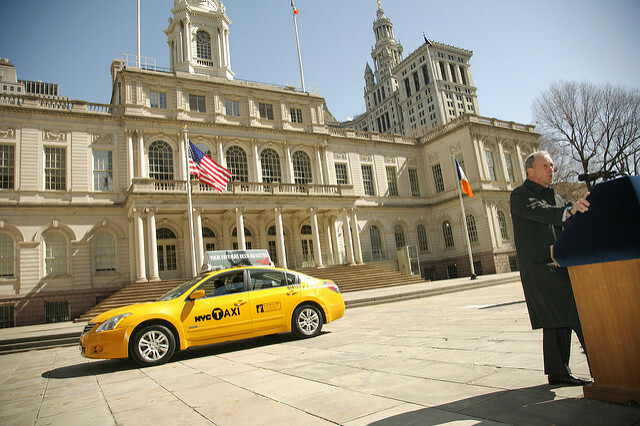 If the world was looking to New York City’s recently enacted legislation affecting for-hire vehicle companies, then there will be disappointment given that, once again, the city’s political establishment decided to impose an outdated regulatory regime on innovative firms, making life harder for thousands of new taxi drivers while raising the price of rides for millions of New Yorkers and visitors to the city. The law, enacted this summer, caps the number of e-hail licenses in the city for a year and also enables the city to impose regulations on the type of compensation structures offered to drivers. Who benefits? Politicians argue that it’s existing drivers who received their taxi registration before the one-year moratorium on new licenses was implemented, but if you think they’re the primary beneficiary then there’s a bridge in Brooklyn I’d like to sell you. In reality, politicians got behind this legislation because they want to send a message to Silicon Valley, the startup community and their financiers: If you want access to the 8-plus million person New York City market, you’ll have to go through the local political class first, and that will cost you: in form of taxes, campaign contributions, lobbyists, and more. True to form, the left and right have staked out their normal positions on this issue. For the left, it’s all about protecting the wages and rights of the less-than-10,000 existing drivers, even if that means higher costs for all New Yorkers and more obstacles for people who want to earn money by driving a car. For the right, it’s about protecting businesses and drivers from regulatory controls that will raise prices for consumers, even if that means facilitating the big business takeover of an industry that has been a source of wealth for independent individuals and small businesses in New York City for a century. What do we want? Safe, convenient rides, with low prices for riders, high income for drivers, positive impacts on traffic, and data protection for everyone involved. The best way to achieve these ends isn’t complex licensure regimes, quotas on new taxis, or putting more surveillance technologies in our cars or on our streets. Instead, New York City should do for its local cab industry the same thing successful industries do for themselves: standardize how information is formatted and exchanged between systems. This makes it possible for information from one app, like Uber, to be read, understood and interacted with by another app, like Lyft or Google Maps. Making ride-hailing data more standardized and interoperable will have a number of benefits. First, it aggregates supply and demand, which increases competition in the taxi market leading to lower prices for riders and more business for drivers. Second, it gives riders and drivers more options, allowing them to use an app with the mission of benefiting New Yorkers instead of benefiting investors in giant tech corporations. Third, it mitigates a threat many people fear: that Uber, Lyft, and other venture-backed ride-sharing apps are subsidizing their own cab rides to undermine the legacy taxi industry, and then once the legacy industry is dead, they’ll jack up prices. That strategy won’t work if New York City is committed to maintaining a system of its own. The idea of establishing a “ride sharing” (or “e-hail”) standard isn’t new. It has been discussed and proposed by a number of people in New York City’s tech community for years, including Ben Kallos, a tech-aware City Council member who proposed it in a 2014 bill, and by Chris Whong, now the lead developer of NYC Planning Labs, who proposed it in a 2013 blog post. Critics of this approach have claimed that the city doesn’t have the capacity to develop its own e-hailing systems, but that simply isn’t true. Generic apps similar to Lyft and Uber exist in hundreds of markets around the world. Even local cab companies in New York City have developed their own apps. Creating an e-hailing system for New York City would likely involve a three-step process: (a) develop a “ride sharing data standards” body that would bring riders, drivers, city agencies, and app developers together to create specifications for how all taxi-hailing information should be formatted and exchanged; (b) develop and operate a basic, open source e-hail smartphone application that would use these data standards to, like any one of the dozens of ride-hailing apps available around the world, allow New Yorkers to request rides and drivers to fulfill those requests; and (c) create a city-administered server that not only processes information from the current city taxi app but also allows other ride-sharing apps to exchange their information with the server. This approach would give Uber, Lyft, and other popular apps a choice: they can plug in to the city’s e-hail exchange server and share their rider and driver information with other apps - or go it alone and face the consequences of having less access to rider and driver information than their competitors. By following established best practices from government digital service organizations and open source communities, this system could be produced quickly and inexpensively. And by open-sourcing an app and inviting other cities to use and modify the New York City code, we could join a small but growing community of cities around the world developing and sharing open source software (such as Madrid’s Consul project) that enables them to provide government services faster, better, cheaper, and in a more ethical manner. The original meaning of “regulation” wasn’t the levying of taxes and fees to penalize innovation -- it was to “make regular” through the implementation of transparent business practices and the adoption of standard operating procedures. That is precisely what New York City should be doing, and it can do so by modelling best practice behavior that challenges Silicon Valley (and its New York-based counterparts) to produce better products, for lower prices, in more responsible ways, with more respect for the rights of their users. Any municipality can throw rocks at Silicon Valley by imposing taxes and creating obstacles to market entry, but few have the capacity and scale to challenge Silicon Valley by creating innovative products. New York City has that ability. Let’s use it. The new effort intends to “bring civic data to life through interactive maps and visualizations, create tools to help New Yorkers better understand the built environment, and build simple web-based tools to streamline internal workflows,” according to the NYC Planning Labs website. Open source software allows others to use it for their own purposes, which can make it easier to build websites, apps, and other products. It also creates transparency, giving anyone and everyone access. Some people will only be able to view what Planning Labs and City Planning put forth, as using and modifying certain software and data visualization projects requires skill, but the theme is more information and engagement, not less. One of the systems created during this time was the NYC Facilities Explorer, which can show exactly how many education centers, libraries, parks, public safety facilities, and health and human services are available in any given area of the five boroughs. Equipped with a color-coded legend, this interactive map makes massive amounts of data far easier to digest than a spreadsheet and can clearly show which communities have more or fewer resources. Web map explorers can have flaws. Missing records or inaccurate data can sometimes skew the visual information, and while this is not the only type of technology NYC Planning Labs will be working with, it is an example of how even modern systems have weaknesses. Open data is considered a vital transparency tool that allows citizens and government to evaluate and improve city services. New York City, considered a trendsetter in this area, committed to this goal in 2012 by passing a law that would make data easily accessible and consumable by the public. Through the city’s Open Data Portal, New Yorkers can access a range of information such as the number and type of complaints made to the 311 helpline, real-time traffic speed data, or where the City Council spends discretionary funding. The Open Data Portal hosts nearly 1,600 datasets across all city agencies. Last year, in the annual progress report on the city’s implementation of the Open Data Law, Mayor Bill de Blasio released a new open data plan, “Open Data For All,” which aims at making the Open Data Portal more user-friendly, making it easily visualized for those with little experience in data or programming, and pushes for more citywide engagement. Following that, the City Council passed a package of legislation to enhance the existing law and improve access to information through the city’s Open Data Portal maintained by the Department of Information Technology and Telecommunications (DoITT). This was the first year which saw some of the new amendments put into effect. These new laws, seven in total, deal with retention of data, building data dictionaries, standardizing geospatial data, establishing timelines for agencies to respond to public requests on the Open Data Portal, mandating timely updates for public data, requiring publication of datasets obtained through Freedom of Information Law requests, and examination and verification of agency compliance. Ra Mashariki stressed that MODA’s focus has been on user research, feedback mechanisms, and technical standards, and he laid out the city’s progress on each while teasing updates that will be released later this year. These updates include a first-of-its-kind analysis with NYU Center for Urban Science and Progress on “data poverty” -- the lack of access or representation of communities in city data; a study with Columbia University’s School of International and Public Affairs on opportunities for community based organizations to utilize open data; and a new centralized mechanism for receiving feedback, with quicker responses and tracking. Concluding his testimony, Ra Mashariki cited an important example of how open data can be useful to the public. He referenced Ben Wellington, a data scientist who runs the blog “I Quant NY.” Wellington examined parking violation data and found that the NYPD had been ticketing legally parked cars for millions of dollars. He took his analysis to the NYPD who confirmed it and took measures to prevent it in the future. Testifying on behalf of DoITT, Albert Webber cited the city’s key accomplishments over the last year -- traffic on the Open Data Portal increased to more than 5 million hits; 116 datasets were made public, bringing the total to nearly 1,600; 100 new data sets are now automatically updated; and more than 40 unscheduled data sets were identified and published. He also said DoITT would soon fill three of four new dedicated positions for the Open Data Portal. At the hearing, government transparency advocates and civic technology professionals wholeheartedly endorsed the city’s efforts, and also made a few recommendations for improvements. John Kaehny, executive director of Reinvent Albany and co-chair of the New York City Transparency Working Group, emphasised “that City Council stay actively and energetically involved in pushing, cajoling and cheerleading for open data in this city,” without which the program can not be a success. The Transparency Working Group is co-chaired by Gene Russianoff, senior attorney at the New York Public Interest Research Group, and its members include Common Cause New York and Citizens Union. “Open data and the idea behind open data is working in New York City,” Kaehny said, also stressing that city agencies will eventually save tens of millions of dollars by using open data. He said the de Blasio administration has “started upping their game” in implementing open data but in his testimony Kaehny pointed out a number of outstanding issues. These included the need for a better process for remedying public complaints about data quality, more standardization of data, clearer agency criteria for publishing data, and publishing high-demand data sets, such as NYPD crime statistics or the Department of Transportation’s street paving schedule. He also suggested other needed improvements to the overall system and the law. Currently, one of the new laws requires publishing the number of datasets requested under FOIL -- a method often used by advocates and journalists to examine city information. These, he said, should also be named. He said the city should also consider creating a data issues tracker to monitor errors in datasets reported by the public, similar to a tool used by the federal government. 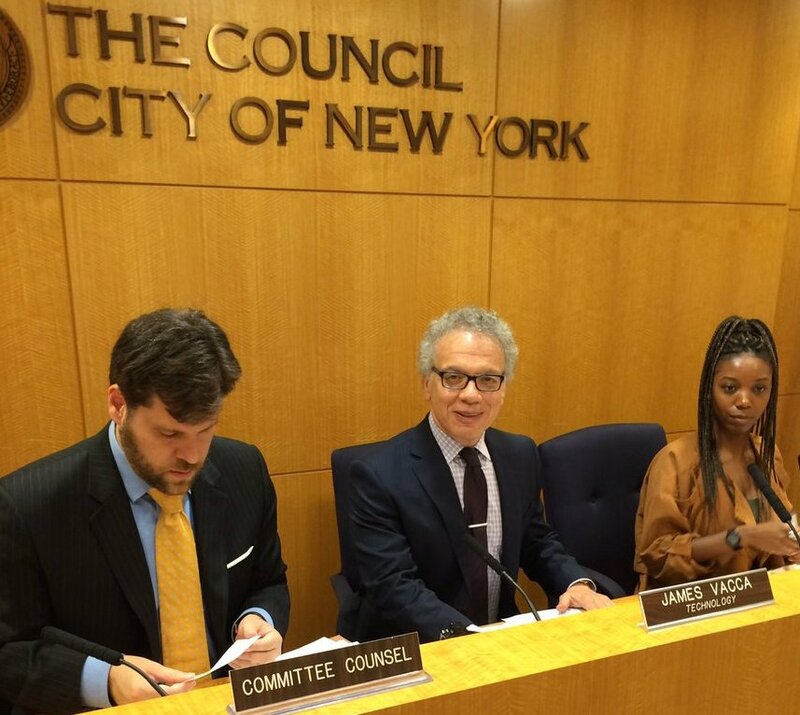 Council Member James Vacca, chair of the technology committee, was generally satisfied with the administration although he raised a few concerns at the hearing. He was especially pleased that one dataset to be added soon will be of snowplow locations, updated every hour, which would give people quick answers during snowstorms when the city usually struggles to clear roads across the five boroughs. He did question the administration on whether certain agencies were fully complying with the law, particularly the New York Police Department. DoITT’s Webber said that agencies “have made strides across the board,” and that the NYPD had added a number of datasets to its website and the Open Data Portal links to them. “Overall I wouldn’t say any particular agency is not committed to doing what they’re supposed to do,” Webber said, adding that he would later follow up with the Council Member with specific NYPD datasets. For civic technology advocates, the major concern is not only the availability of data but its usefulness to the public. Noel Hidalgo, executive director of BetaNYC, a civic technology and open government group, made this clear even as he praised the administration and the Council for their push on open data. “The seven pieces of legislation that were passed are taking us in the right direction and have really strengthened the city’s open data practice,” he said. But Hidalgo pointed out that one big weakness, echoing Vacca’s words, is figuring out how to teach community groups to access, understand and utilize open data. “Frustratingly, there are zero best practices out there on how to teach the city’s open data to itself,” Hidalgo said. Hidalgo added that under the provisions of the new laws passed last year, the data dictionaries need to contain tutorials and that there needs to be easier access to bulk data downloading. Finally, he stressed the need for the city to create an open data legacy that can last through successive administrations and City Council classes, with a unit dedicated to leadership, standardization, development, and education. There was also consensus at the hearing among advocates that the very infrastructure of the Open Data Portal could be modernized. Joel Natividad, director of open data at OpenGov Inc., said the portal, currently run by a contracted vendor, needs to be an open source platform that can “support innovation and experimentation” by universities, non-governmental organizations and the private sector. This will allow the city to “tap the genius of the crowd,” he said. Kaehn, of Reinvent Albany, agreed, saying the current platform has severe limitations.